This week’s SURNAME SATURDAY themed post looks at the HAYLOCK family of Ely, Cambridgeshire, England. 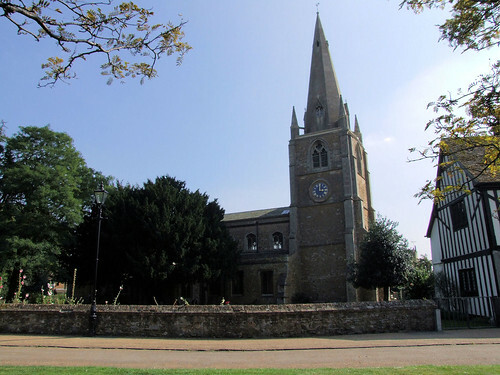 This week’s Surname Saturday themed post, takes a look at my Haylock family connection, living in Ely, Cambridgeshire, during the 18th and early 19th Centuries. I’ve seen the Haylock family turn up amongst the branches of my relatives, but only recently have I stumbled across them in my ancestry. The most recent ancestor to carry this name was my 6x Great Grandmother, Mary Haylock, wife of my 6x Great Grandfather, Francis Newell. St Mary’s Church, Ely. Photo: Robert Cutts via Creative Commons. Mary was one of at least three (perhaps five) children of John Haylock and his wife Elizabeth (my 7x Great Grandparents). It seems that Elizabeth’s maiden name was Elizabeth Parson, but there is a bit of questioning here, as whilst a John and Elizabeth Haylock had two sons (both named John) in 1769 and 1770, the only marriage for a John Haylock and Elizabeth at any time around those dates, is actually in 1772 in a marriage at St Mary’s Church, Ely (right place) – after their baptisms (wrong time), and just before Mary’s (maybe not so wrong after all). I’m therefore documenting it, but treading carefully with this option. Whilst the legend of Robin Hood may well have been a fabricated story, ‘Little John’ does indeed sit in my ancestry. My 7x Great Grandfather John (mentioned above) is noted at the 1773 baptism of daughter (and my 6x Great Grandmother) Mary as ‘little John’. I’m pretty sure we’re not talking height here, it’s far more likely to have related to his position in family hierarchy – and is probably the son or grandson of another still living John Haylock. This is where my trail goes cold for now. However, the Ely Haylock family turn up a few times in other branches of my ancestry including as spouses in my Newman and Yarrow trees. I also once had an English teacher called Mrs Haylock. Some of these variants interchange during the same year, an indication at just how volatile the spelling was, how low literacy was, or how thick the fenland accent was carried across. As this just represents one parish, I’m sure there will be other variants. There’s even a memorial tablet from 1863, to a Charles Theodore Harlock who drowned aged 29. I’ve no idea if he might be related, but could no doubt determine his immediate ancestry through the records and available censuses. Ancestry.com suggests that the origin of the name Haylock comes from an old Anglo-Saxon personal name. They also show that in 1891, Cambridgeshire was home to 23% of all of the UK’s Haylock name-bearers. Lovely to find your post on your Haylock ancestors from Ely. Thoroughly enjoyed your story and your humour! I have been tracing the Haylock lineage for over 30 years – ours came from West Wratting, Cambridge, but I believe all Haylocks would be related way back. They seem to have mainly congregated around Suffolk and Cambridge, the oldest records I have found are from Soham and Guilden Morden. Difficult though, to prove relationships and trees, due to them all having the same names! Greetings Andrew (and Sue), I share the same Haylock (various spellings) line with you Andrew. I traced back to Flanders Haylock (which I think may derive from Flemish immigrant origins after religious persecutions in Belgium many centuries ago). I then searched online and your blog came up. I enjoyed it immensely and will peruse through your other pieces. My email is janeqatar@gmail.com if you or any other Haylock relatives would like to make contact. I am descended from Elizabeth Haylock who was born in Jersey Island to Jeanne Amy and William Haylock – a soldier from Ely, Cambridgeshire. I have a tree for this line on Ancestry.